What a beautiful, warm, sunny day. 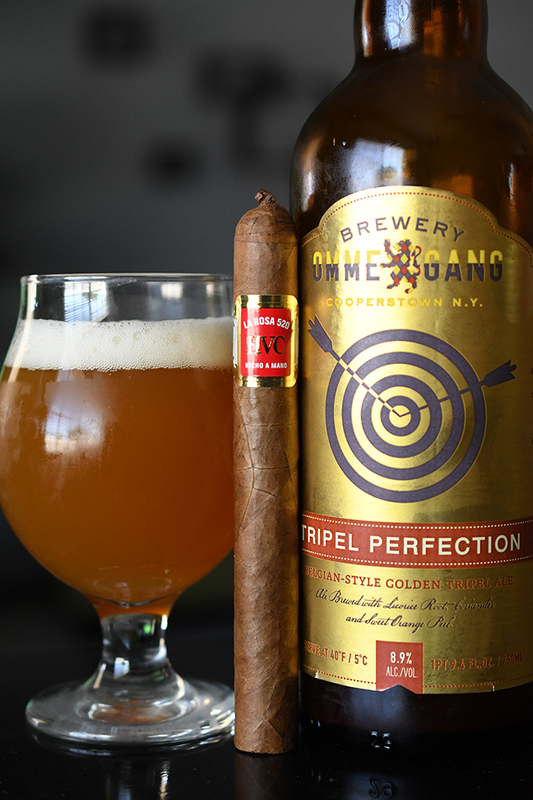 Days like these are made for enjoying, and I am enjoying mine out back with a HVC La Rosa 520 Reyes and a bottle of Ommegang’s Tripel Perfection. 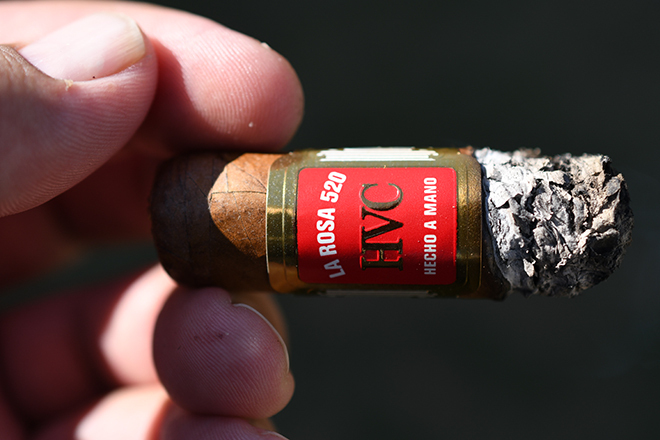 HVC Cigars are no stranger to Casas Fumando. The boutique company makes some incredible cigars. Founded by Reinier Lorenzo the HVC La Rosa 520 focuses on Havana, where he was born and lived before coming the U.S. a few years ago. 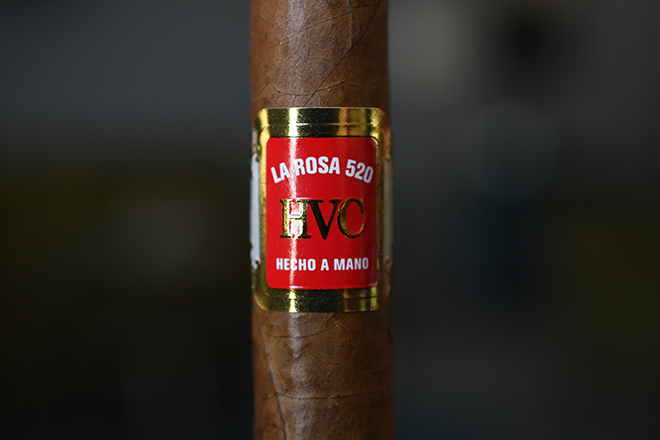 HVC stands for “Havana City Cigars” and the La Rosa 520 was created as a tribute to his upbringings named after the address he resided at within the city. 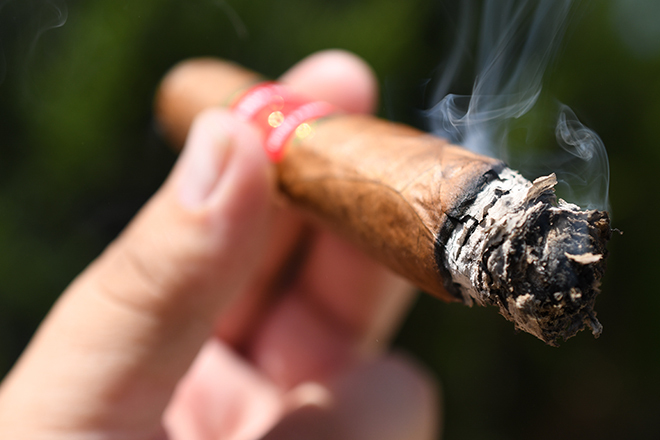 The cigar itself is created at the TABSA – Tabacos de Jalapa S.A. factory in Estei, Nicaragua. Lorenzo created the blend by seeking out tobaccos that reminded him of San Luis and San Juan y Martinez regions of Cuba’s Pinar de Rio province. The cigar was originally released as a limited edition (250 boxes of 20) production blend in a single 5 1/2 x 54 format in 2015 before this particular “Reyes” line was released last year featuring a 6 1/4 x 48 format. There are only 500 boxes of 10 released and the HVC La Rosa 520 Reyes runs $11.80 per stick. We purchased these over from our friends at Ford on Fifth. The HVC La Rosa 520 Reyes features a really gaudy, rustic looking wrapper. 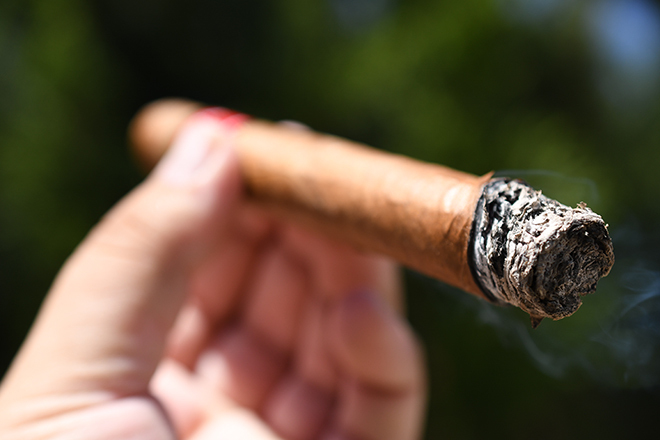 The color is mostly medium/light brown with a good amount of both darker and lighter splotches scattered throughout the cigar as it gives off a nice orangish gleam. The wrapper features a good amount of small veins and natural webbing as the wrapper itself is laid seamlessly over itself. The wrapper’s texture is very toothy, grainy, and oily white the wrapper feels very thin and delicate as the cigar is very heavy and tightly packed all the way up to it’d round, triple-wrapped cap. 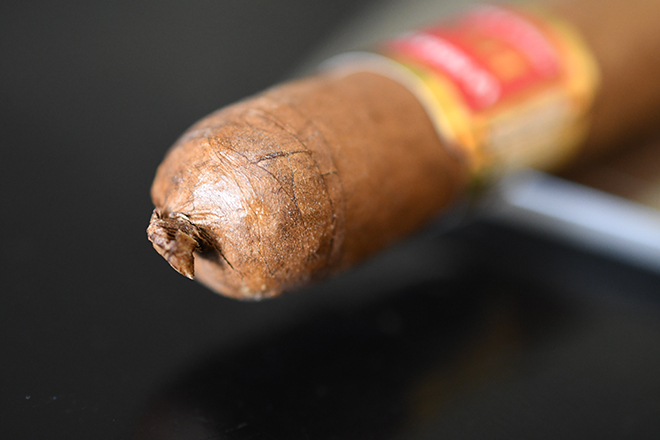 Polishing off the cigar is the same red, gold, and white wrapper we found on the previous release of the HVC La Rosa 520. 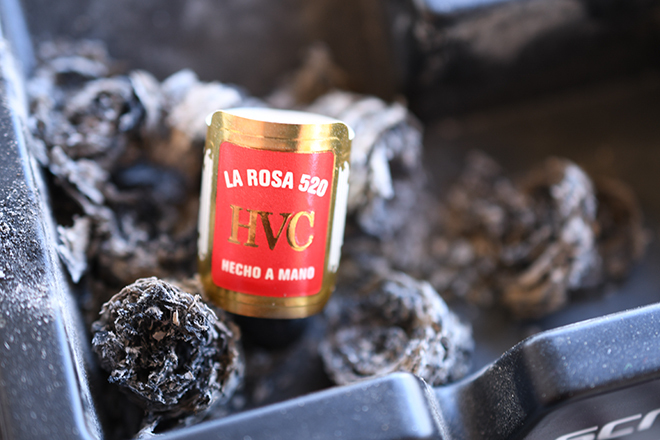 The wrapper on the HVC La Rosa 520 gives off a beautiful spiced cedar and floral aroma while the foot of the cigar releases some soft sweet notes over more cedar, spice, and natural tobacco aromas. The cigar cut like butter under my Xikar double bladed cutter. The cold draw gives off some bold pepper over sweet cedar and you guessed it, more spice. The HVC La Rosa 520 started out with a pretty big pepper boom right out of the gate. That pepper quickly faded and the cigar left me with some very sweet cedar, saltiness, honey, citrus, and a really nice overall natural tobacco taste. The draw is perfect. Each puff moves out a large amount of thick, white smoke which hangs around for quite some time before fading. The cigar also lets loose a good amount of stationary smoke as it rests in my ashtray. The burnline is pretty crazy and really thick as it leaves behind a trail of flaky white, and light gray ash wich barely held on for about a half inch before falling into my ashtray. 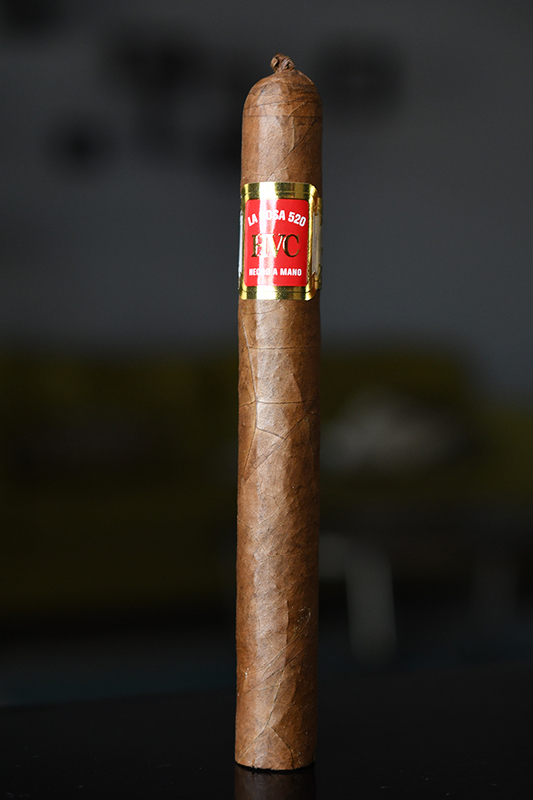 The flavor really become more vibrant in the second this of the HVC La Rosa 520 Reyes. The cedar is leading the charge with some great floral flavors, a bit of musk and spice, a great sweetness and honey with a dash of pine and saltiness. This cigar does really resemble Cuban style with a nice Nicaraguan twist. The retrohale is incredible as it coats my nasal passage with bold cedar and tart citrus. The burn line is still pretty wacky but I haven’t had to reach for my torch yet. The wrapper is cracking a bit which goes back to my thoughts on how delicate it felt, but the insanely dry El Paso climate probably has a lot to do with it. It’s not impacting the experience at all so no real complaints there. I close out the second third with nothing in terms of nicotine. Into the final third of the HVC La Rosa 520 Reyes and the flavors have started to cream out, yet become a bit more bold as they reach into the medium/full bodied range. The leading flavor is still the cedar backed by musk, spice, clove, honey, brown sugar, and the floral flavors are still hanging on. It’s a great flavor profile. The cigar is still cracking a bit as the burn line finally begins to even out but I never once had to reach for my lighter, nor did the cracking even hinder the experience so no points taken off there. It took me about an hour and forty five minute to take this cigar down to the nub and it was incredible the whole time. The HVC La Rosa 520 Reyes finished with no harshness, nor extended heat while I got only a very slight nicotine kick from it. As I said before, I am a big fan of HVC Cigars and the HVC La Rosa 520 is at the top of that list. 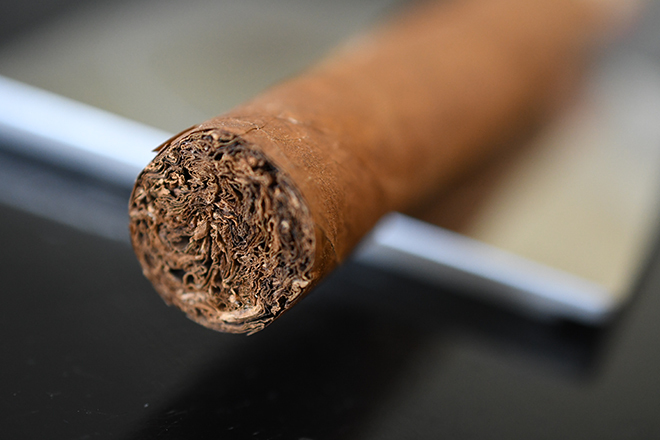 The cigar is complex, full of subtle flavors while remaining mild and traditional. It’s an incredibly well-balanced cigar that anyone can enjoy from mild to bold cigar smokers, from novice to seasoned cigar smokers. The price point is probably right where it should be and my only real gripe about the cigar is how limited it is. I will be acquiring a good amount of these for sure as I could easily see this cigar becoming a go-to until its no longer around. Ommegang seems to pop up in my reviews almost monthly. Ommegang is a Belgian-style brewery in Cooperstown, New York and their Tripel Perfection is a Belgian-style Tripel which comes in at a modest 8.9% ABV. This particular bottle has a packaged done of November 2014 which is strange, cause I didn’t even know I had it in the cellar. The Tripel Perfection starts with a dash of celery, clove, spice, malt, and slight hop with a very light mouthfeel before finishing with more spice, apple, light hop and clove. Some great citrus flavors really come to the front as the beer warms. It was an easy choice pairing this beer with the HVC La Rosa 520 Reyes as the flavors really mashed up well while neither the cigar nor the beer overpowered one another.